The Peace Palace started as an idea during a discussion in 1900 between the Russian diplomat Friedrich Martens and the US diplomat Andrew White. The idea was to provide a home for the Permanent Court of Arbitration (PCA), which was established in 1899. Guided Tours inside the the Peace Palace building itself are very difficult to arrange as it is nearly always closed to the public (as it is a working court). However, the next best thing is to let our Tour Guide you into its free information center to see it's permanent exhibition and watch its excellent educational film. The creation of the Peace Palace at the end of the 19th century was at a time when the idea of world peace was being discussed like never before. 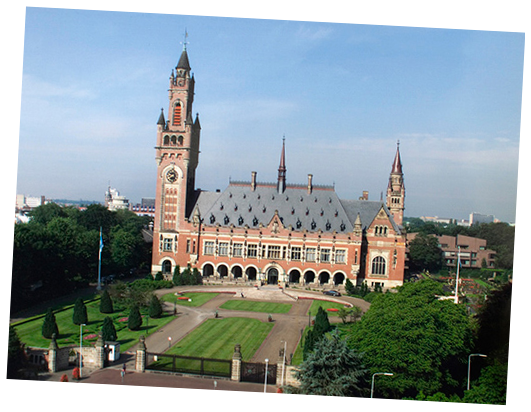 In 1903 Andrew Carnegie (USA) agreed to donate $1.5 million (about €50 million adjusted for inflation) needed to build the Peace Palace that would house the PCA as well as to provide a library of international law. Europe and the United States of America had many peace organisations, with millions of members. This huge international peace movement was encouraged by high-profile writers and pacifists such as Leo Tolstoi (Russia), Bertha von Suttner (Austria) and Jean Bloch (France). At the dawn of the 20th century however, and just one year after the opening of the Peace Palace in 1913, the First World War broke out. The palace plans initially had two big bell towers in front and two small ones in the back. Unfortunately budget constraints and only one big tower and one small tower remained in the final building. Sightseeing around the Peace Palace is ful of interest too as there is a Peace Flame as well as the worlds first 'super highway' in The Hague (a.k.a. Den Haag) and the world going to Scheveningen. The Palace was furnished with many gifts from the different nations who attended the Second Hague Conference as a sign of their support. Among the gifts that are shown on the film are a 3-tonne vase from Russia, marble staircase from Italy, a mosiac floor from France, a fountain from Denmark, wall carpets from Japan, the clock for the clock tower from Switzerland, Persian rugs from Iran and wood from Indonesia and the United States of America. The palace also contains various statues and portraits of prominent peace campaigners from around the world and of all eras. Every member country of the International Court has their own chair with a large elaborate hand-embroidered emblum on the back representing their country. Tour The Hague has heard that just to repair older chairs cost tens of thousands of Euro's and that a few countries have refussed to sit on other countries chairs and so they sometimes have to put a cover over the emblums so that no-one can see them ! ?